So much to like in these helmets and one poster said, 'elegance'. You really appreciate it when you build one from kit. Not to sound too weird, but you can almost sense the artistic and talented hands that went into the original sculpt. How one curve flows seamlessly and naturally into the next curve. I just completed a Laws helmet, and I would say a reason for choosing it would be that it omits the bumps, nicks, and bruises that some other kits include intentionally. 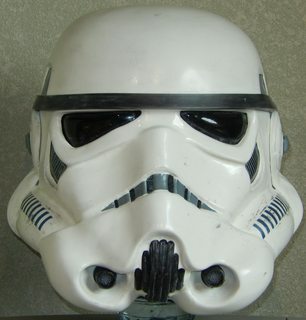 In this helmet you get more of an idealized, untainted form. Then it's up to the assembler and finisher to decide whether to keep it like that or transform it into a more screen accurate version. This is white HDPE, and imperfections were solely introduced by me (though I must admit not intentionally!). A very nice helmet indeed. Did you get the mic tips from DL? Thanks! The kit didn't come with mic tips nor the S-trim. 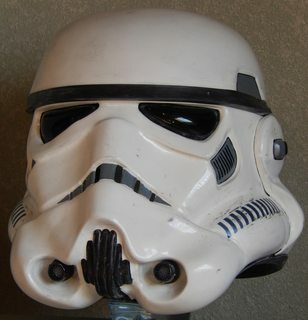 I "borrowed" the mic tips from my eFx PCR helmet which is in a not-so-good state after I tried some modifications on it. Finding accurate S-trim is not easy. This one is from trooperbay and is relatively thin. The S-trim RS uses for its helmets appears to be much thicker, which I expect is the accurate size. Base helmet kit: Dan Laws Beige HDPE (and white ABS ears). I reshaped the whole shape of the helmet kit (too much wide). 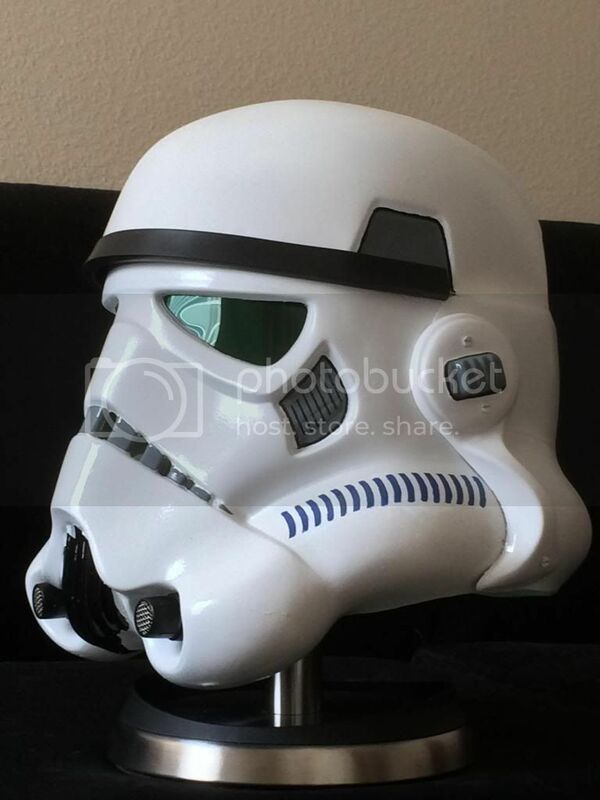 Painted it with correct khaki primer (inside and outside), plastified it (in order to help the paint to stick on it) and textured it in order to simulate an original helmet (the DL kit is initially smooth). Faceplate riveted to the cap back, ears screwed. Very nice job and complete finish-out for this high ranking ESB. Yes, this helmet is a bit wide as-is. 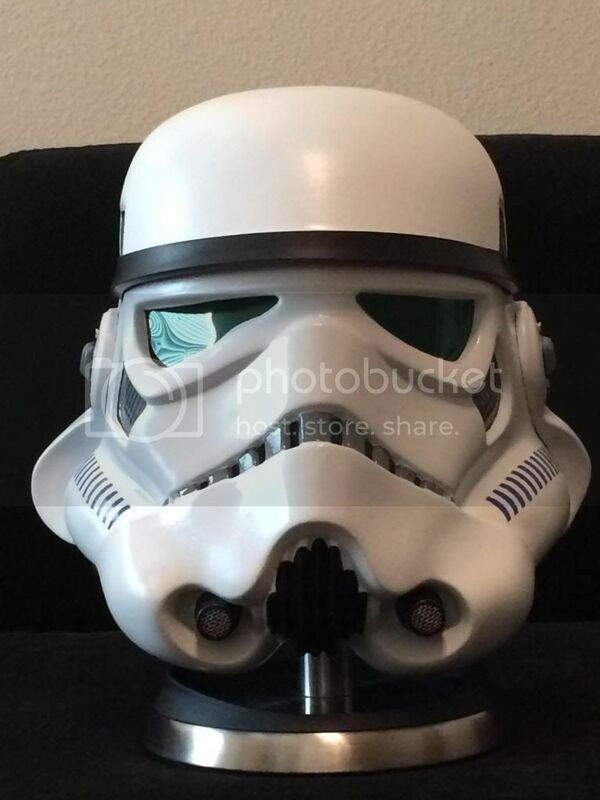 To add some height, I gave mine a high brow and put a plastic brace inside the helmet secured with velcro between the faceplate and dome to push them apart. How did you "plastify" it before painting? I'm getting the typical HDPE paint flaking in high flex zones and where the HDPE is thinner. At some point I'll probably carefully mask off the detail areas and give it another spray coat. It's a kind of varnish, which needs to be brushed, very flexible. So you can manipulate the helmet without cracks appearing. Of course, if you make a battle with it on your head, it will age just like the screen used props ^^. My RS helmet kit is still in its box! but I want to get around to it soon. I've heard about a brush-on covering for plastics like HDPE that'll enable paint to stick, could you tell me what brand you used please? Red Oxide Primer is supposed to be very good too and may be the stuff that was used on the originals, but I think the plastic still needs treating in the way you've done first. It seems that not all the original helmet received this particular red primer (according to the pictures). I used a plastic primer (clear), then the khaki automotiv primer (it's more a filler than a primer), then the brushable varnish and finally a thick coat of paint. And I guess the result could be better if you sand the helemt before. I already done this technic on my fist DL HDPE helmet (that you can see upper in this thread) without the varnish. 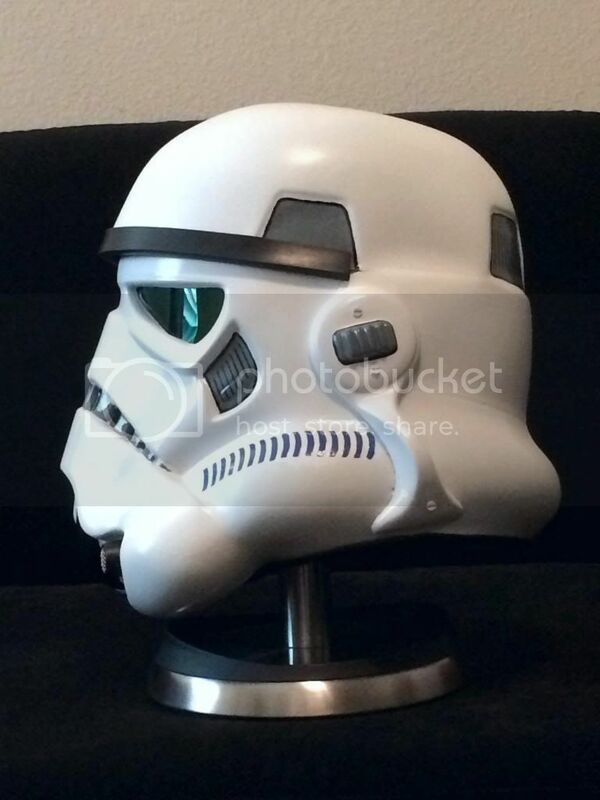 The actual owner seems still happy with it without any trouble (but it's a display helmet, no trooping). 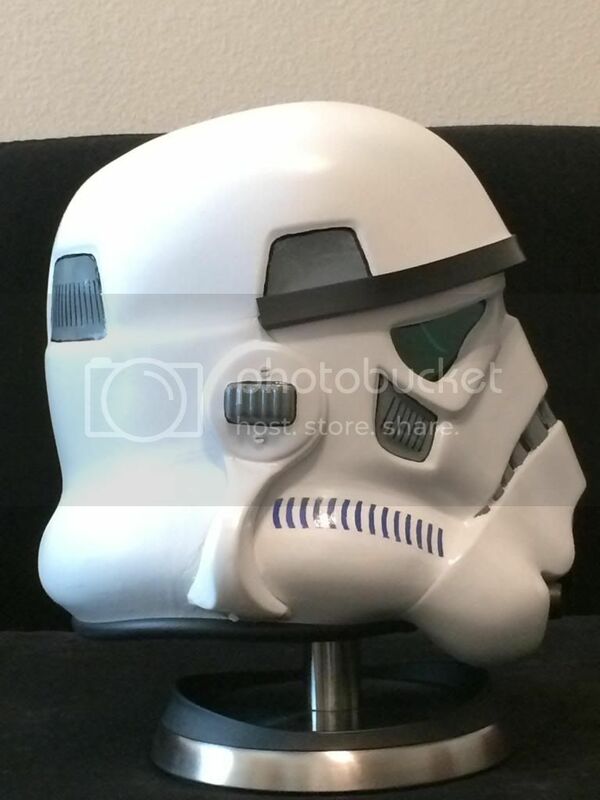 Based on RSprop ANH stunt helmet kit (ABS). After hours and hours of sanding, reshaping, heating, sculpting, etc...and all the steps to finish a kit, here's a "RSprop" Hero helmet. Hand painted details. Green acetate bubble lenses on a single sheet. And special credits goes to Vaj for his incredible and accurate three parts mic tips!!!! Nice work! 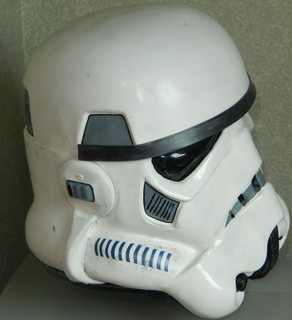 It demonstrates how the shape of the stunt helmet could have evolved into the hero shape. It's generally thought that the same buck was used to form both the stunt and the hero helmets but over the course of production from the initial stunt helmets to the last pulls (hero) the buck underwent change (intentional or unintentional) that gave rise to the hero shape.